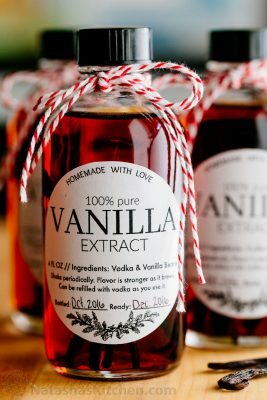 How to make Homemade Vanilla Extract - it's so easy and only requires 2 ingredients! This will become your secret ingredient for baking. Wash and sanitize bottles and lids: Wash with mild soapy water, rinse, then carefully swirl with boiling hot water to sanitize them. Cut beans in half then Split beans (it's easiest with kitchen scissors), cutting them about halfway down the stem. If the beans are too dry to split, cut them into 1" pieces. Place a total of 1 1/2 whole beans in each jar (or 3 split halves). Use a funnel to pour vodka to the top of jar. Cover tightly with lid and let them brew for 2 months, shaking occasionally. It's easy to scale this recipe up or down, the proportions are 3 whole vanilla beans per 1 cup (8 oz) vodka, or 1 1/2 vanilla beans per 1/2 cup (4 oz) vodka.